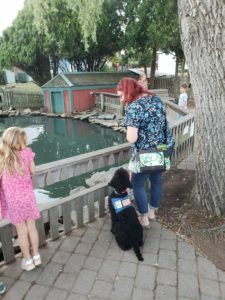 We ask people from the public to raise service dogs for us. The commitment is about 18 months. Once your pup is housebroken, we ask that you take him or her out in public to places that you go, and to weekly training at our Medway, MA facility. There are lots of options for puppy raising–split the pup’s time between your home and a friend’s, raise the pup full time as your own, or be matched with a weekend puppy raiser by our trainer. You provide: a safe, loving home, treats, toys and chews. We provide: training classes, food, vet care, and of course, 24/7 support. Who is eligible? Stay at home people with busy schedules, people who work from home or work in dog friendly environments, active retirees, home schoolers, etc. The ability to submit weekly online progress reports is a must.